My kids love playing with puzzles. We have actually made our own Puzzle in a Box that works on fine motor skills and have done a few fun literacy activities using these fun foam sticker puzzles with Big Brother to practice his spelling word list and a Name Recognition Activity included in our book, 99 Fine Motor Ideas. Today we are sharing an activity using foam sticker puzzles to practice building CVC and Sight Words. My kiddos LOVE these puzzle alphabet foam stickers! 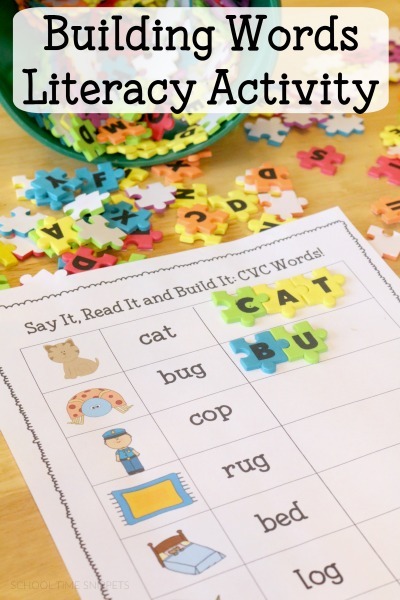 They have been a fantastic purchase because they can be used for so many things, including today's Say It, Read It, and Build It Literacy Printable. We purchased a large bag of the puzzle stickers from Walmart a few years ago. This is a wonderful activity for your beginning reader. In this activity your child will recognize the picture and SAY the word, READ the word, and then using sticker puzzles will BUILD the word. The activity emphasizes phonemic awareness, segmentation, and letter recognition! 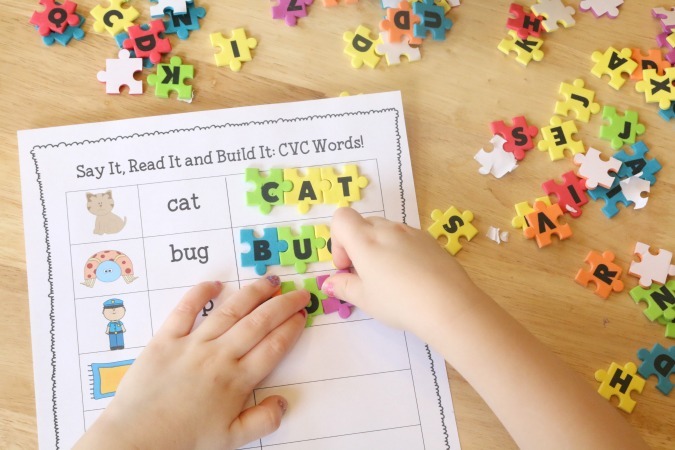 Provide your child with foam puzzle stickers and one of our three Say It, Read It, and Build It Printables. 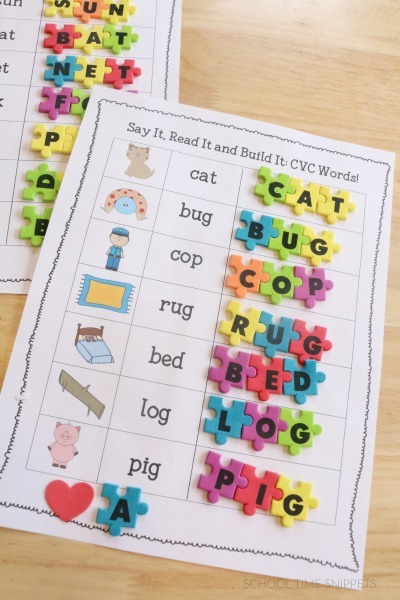 Two of the printables consist of CVC words, the other is blank and was made so that you may use this activity with sight words. Download and print your Say It, Read It, and Build It Literacy Printable here! Unfortunately, these puzzle letter stickers are no longer available to purchase however you could use dot stickers and write the letters on them, or use other letter manipulatives like letter tiles, stickers, or beads.